Mercury and Venus are together in the west at dusk. Venus outshines everything but the Sun and Moon, so you can begin observing it during deep twilight. Once you’ve found Venus, look for the dimmer Mercury, which will be above Venus and a little to its left in early June. The crescent Moon is near the pair on June 10. After mid-month, we see Mercury reverse field and head back into the glare of the Sun. Saturn is now an evening object, shining in the southeast at dusk. Although not as bright as Venus, it does outshine the stars around it, so you can’t miss it. Mars and Jupiter are out of sight on the far side of the Sun this month. 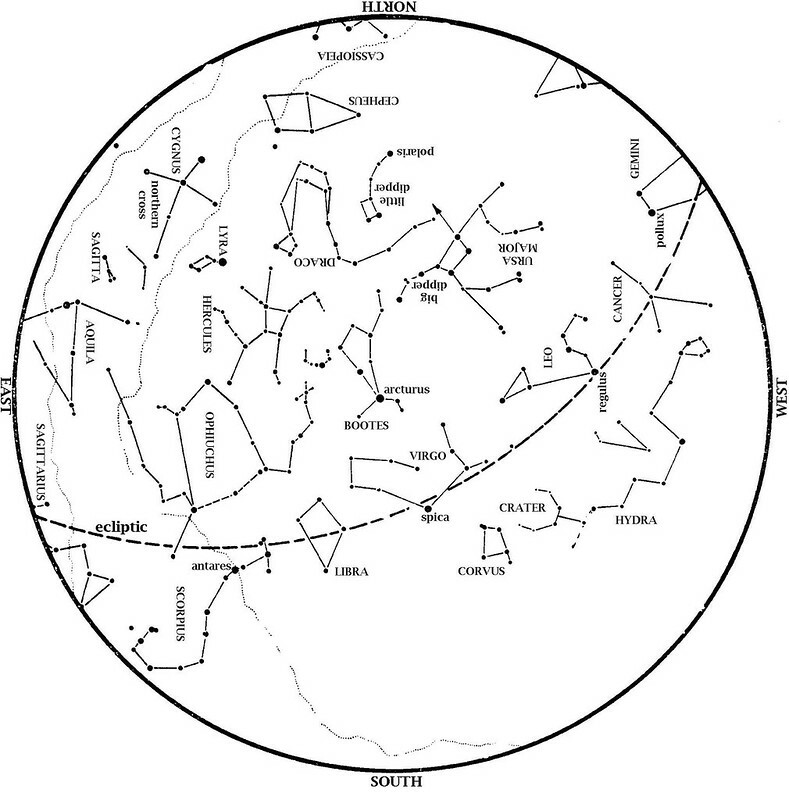 The Big Dipper is above the North Star, with its handle pointing up. From that handle, you can ‘arc to Arcturus’ and then ‘speed on to Spica’ — those stars are in the south at dusk. Leo the Lion, is high in the west at dusk. New June 8, 10:58 a.m.
First Quarter June 16, 12:24 p.m.
Full June 23, 6:33 a.m.
Last Quarter June 29, 11:54 p.m.
At 12:04 am on Friday, June 21, the Sun is directly overhead at the Tropic of Cancer, the farthest point north at which the Sun can be overhead. This is therefore the summer solstice. On this date, those of us north of the equator enjoy more daylight and less night than on any other date of the year. In the Southern Hemisphere, folks experience the longest night and the shortest day, and the season is winter. On most clear Saturday nights at the George Observatory, you can hear me do live star tours on the observation deck with a green laser pointer. If you’re there, listen for my announcement. I generally do one such tour on short May nights. To enjoy the stars in any weather from the comfort of the HMNS Planetarium, click here for a full schedule.